Guess what? I went to a prenatal class + they said that you can eat sushi while pregnant! Pregnant women in Japan eat it all the time! 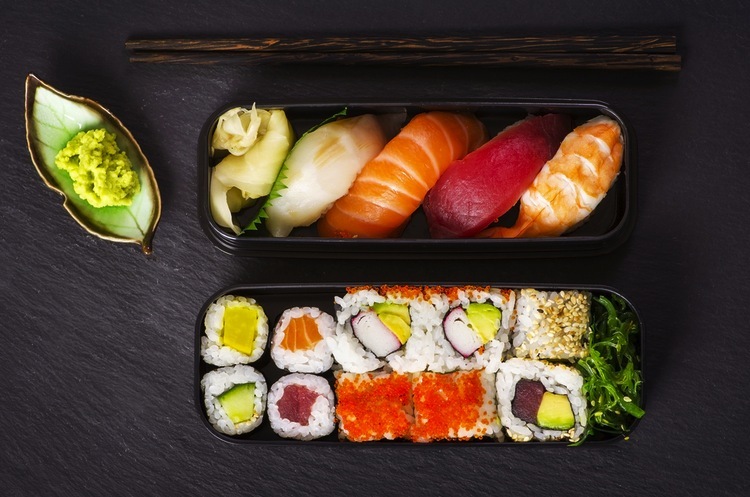 The only reason they say to avoid sushi is because of the fear of food poisoning from bad sushi, which can happen to anyone pregnant or not. So if you go to a high end reputable sushi joint, there should be no problem. I’ve never had food poisoning from sushi. That being said, I still have avoided it because being doubled over the toiled pregnant is something I don’t want to risk! But it is harmless to the baby! Who knew?! But yes, mercury is a danger. Salmon is low in mercury + so high in omega 3s! I eat it like a champ! REALLY? Now you tell me? Lol I’m going to make it the sweetest return to normal, by holding off until Peanut comes. I’ve made it this far without having any, what’s a few more weeks? And truthfully, I’ve had crab salad rolls and California rolls about three or four times, so I’m not COMPLETELY deprived. I just REALLY miss sashimi. I’ve managed to avoid morning sickness for my entire pregnancy, and I was worried about sushi maybe making me ill… I do have a good sushi joint that I frequent so I really shouldn’t have any worries. I’m just superstitious, is all.